I'm so behind with my writing at the moment. Our one day together each week we've been trying to use as a family day out day. 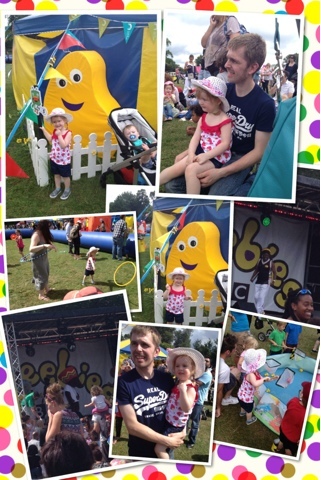 Last week it was the seaside but the week before that we attended a very special event, Mr Bloom and Friends' Big Day Out. We attended the event at Abbey Park in Leicester but there are still some events across the country that haven't taken place yet. The day out is completely free for everyone with lots of fun activities for children of different ages. There is a Mr Bloom Live show which you can apply for free tickets for online on the BBC website. We missed the show we had tickets for as we were a few minutes late but queued up in the standby queue an hour later and got in to the next showing as well as everyone else in the queue. The show was fantastic and all the kids sat at the front on beanbags and you could see they were mesmerised by him. He has such a great stage presence that makes the kids love him. Of course the veggies were there too so everyone got to sing along to the 'meet the veggies' song and the 'night night veggies' sing at the end. 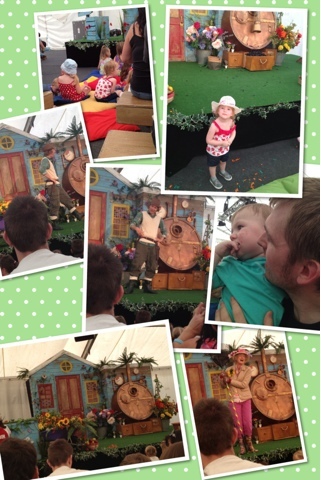 Gracie loved the show but was scared of Julian the wriggly worm! Unfortunately the kids couldn't meet Mr Bloom which I know Gracie would have loved but he must have been busy with so many shows over the whole weekend! After the show we had a walk around all the stalls looking at all the activities and Gracie joined in with as many as she could, she caught some ducks in the paddling pool with a net, she decorated a plant pot and was given a plant to look after in it, she did some colouring and got some pinecones from the forestry commission stand, she played with a hula hoop and other outdoor toys in the big inflatable area and her favourite part of the whole day was watching Rastamouse on the main stage singing and dancing with the easy crew. We all had a good dance along with Rastamouse before going home. It was a lovely day, the sun was shining and didn't cost us anything. The only money we spent was on drinks and food as we only bought packed lunch for the kids. I would really recommend you check the BBC events webpage to see if he is coming to a venue near you! Or you can even sign up to the mailing list choosing what type of events you would like to hear about so you get the information straight to your inbox. The BBC run so many great free events and shows to look out for. I didn't know their events are free, will have to go and look!